This summer Noelle Theard, an MFA Photography student at the School of Art, Media and Technology at Parsons The New School for Design, has been putting together something of an unusual art show. The artists are residents of a trio of crumbling Sunset Park, Brooklyn, apartment buildings who are currently on rent strike. The works on display are photographs of the horrendous conditions in and around their apartments: crumbling ceilings, cracked floors, even a toilet teetering on a fire escape. “Not even animals live like this. We live worse than pigs,” Sara Lopez told The Daily News for an article about the show. Her photos were of extensive mold on her walls. 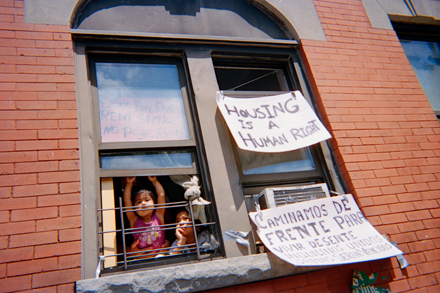 In collaboration with Occupy Sunset Park, Theard obtained and distributed disposable cameras to Lopez and other residents of these buildings, and provided them with basic photography instruction so they could document their living conditions. The show, at La Casita Comunal de Sunset Park, 414 45th Street, Brooklyn, will be on display every night from 6:00-9:00 p.m. until August 19.